Wave the Swallow (or simply Wave) is an eighteen-year-old swallow and the mechanic of the Babylon Rogues. 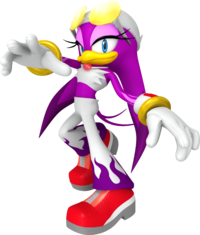 She plays her most prominent roles in the Sonic Riders series. Wave's artwork from Sonic Riders makes an appearance on a sticker in Super Smash Bros. Brawl. The sticker empowers its user's arm attack. While Wave makes no appearance in the games prior to the fifth installment, she has a Mii costume based on her in Mario & Sonic at the London 2012 Olympic Games and Mario & Sonic at the Sochi 2014 Olympic Winter Games. She makes a playable appearance in Mario & Sonic at the Rio 2016 Olympic Games. This is her only physical appearance outside of the Sonic Riders series. This page was last edited on February 9, 2019, at 19:57.